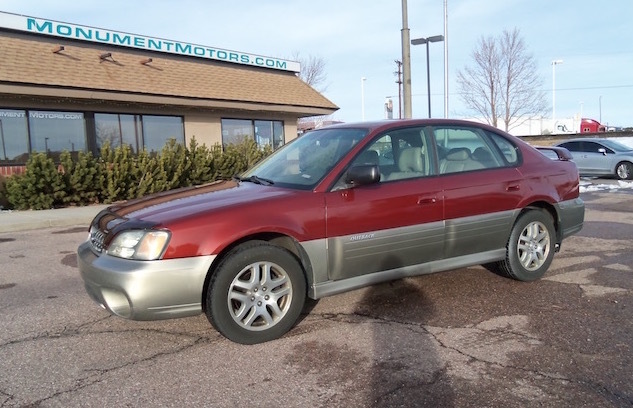 2004 Outback 3.0H6 Limited Edition SEDAN at Monument Motors, your source for used Subaru Outbacks near Colorado Springs, Castle Rock & Denver. Trade-in! Local, two owner, low mileage Outback Limited Edition sedan with 3.0L H6 boxer engine, automatic transmission, heated tan Leather seats, heated mirrors & windshield, side-impact airbags, premium am/fm stereo with in-dash 6CD player & cassette player, subwoofer/amplifier, alloy wheels, nearly new premium Cooper tires, digital climate control, remote keyless entry, alarm, auto-dimming mirror with compass, cabin air filtration, woodgrain accents, rear-seat ski pass-thru, rubber mats and rear spoiler. (The original Factory MSRP on this fully loaded Outback sedan was approximately $30,000.) This Subaru qualifies for a 5year or +100,000mile Extended Service Plan at an additional cost. JUST SERVICED AND NEW: engine oil & filter, air filter and cabin air filter. New premium Cooper tires were installed at 111,400 miles, and a new battery was installed at 109,200 miles. The head gaskets & valve cover gaskets are dry, and no oil or coolant leaks. This 3.0liter boxer engine has a timing chain, so no timing belt to change. PLEASE CALL FOR ADDITIONAL DETAILS & DISCOUNTED PRICING.